Testing for lead in your water requires specialized techniques to get an accurate reading. Listen to this TDT Podcast to learn how LeadSmart certification will not only keep you healthier but could soon contribute to the resale value of your home or business. Charlie: What’s in the water you drink? Your pipes could be contributing to an unhealthy situation. Our guest today is an expert on the topic, Gary Gould, with TDT Plumbing in Houston. Hi, Gary. Charlie: I’m doing well, but I understand that our water may not be so well. And one of the things we’re hearing about, we’re seeing in the news is lead in the water. We’re seeing it in schools, we’re seeing it in buildings, municipal facilities and I suppose it’s in homes too. How common is lead in our water? Gary: Lead is more common than anybody probably wants to admit. I’m here to tell you no matter what the age of your property is you’re always at risk and lead is in solder, it’s in faucets, it’s in fixtures and hose bib connections, it’s in supply lines. It’s in about everything, and nowadays people do not want it in their drinking water. So now we have to abate it, get it out of the drinking water and the only way to do that is to deliver it clean and have clean pipes bringing it into your home. Charlie: So how do you determine how much lead is in the water and is there a level that is safe? Gary: Well, I think some would argue that no level is safe and I think the best you can do is to minimize and try to make as least amount available as possible. Gary: So the way it’s done typically is you take water samples. We have a nice lead kit and a copper kit where we can take drops from different faucets, and we can test for the presence of lead or the absence of it and get a concentration for that. And the EPA and other water authorities, they set guidelines as to what’s acceptable and what’s not acceptable. But again we want to minimize it. Nobody likes to drink lead. Charlie: Right, because is it something that’s going to build up in your body and you’re never going to be able to flush it out. Gary: Heavy metals. Heavy metals are bad. Mercury, lead, any of those are not things that you want to have in your body for 50 years. Charlie: So tell me, what is LeadSmart? I see that on your website. What does that mean? Gary: LeadSmart is a program that Ace Duraflo has started, and we’re involved with. It’s a process of us being able to certify the drinking water system of a building. Could be an office building, could be a school, it could be an apartment complex, could be your home, where we come in and through a process of testing and investigations, looking at the material components, the various fixtures and what have you, monitoring and testing the water where it comes in from the city. We take this package, and we’re able to come in and verify a property lead-free. We want to get it to where these major influences are removed. So there’s a whole process of testing and abatement and taking care of that. And that’s part of that LeadSmart program. Charlie: Let’s talk about that abatement part because if it’s a given that there’s probably lead in every pipe, what are the steps you take to abate that situation to eliminate the lead from my water? Gary: Could be simple. And again the investigation and that whole process starts with let’s see how the water is coming in. Certainly, if it’s coming in with excessive levels of lead, if you live in an older home, older neighborhood, it’s like 50-year-old, 60-year-old homes, we want to make sure that’s what coming from the city is clean. And that’s easily checked. As far as in the properties we will go through a system of checking each and every pipe and water supply coming out of various faucets. And we’re looking for a contaminant. It’s very common that contaminants come from small pipes, comes from brass fixtures, it comes from within the home or the property. So we’ll go through a process of evaluating solder on copper joints, evaluating the type and the age of different fixtures and we’re backing that up with testing of the water at each and every location. So the abatement will then occur after we’ve identified a source. It could be as simple as putting a new faucet on. It might be that faucet is the contaminant. Drinking water fountains, probably one of the number one contaminants in schools. By design, they’re nothing more than a nice collection vessel, and they collect debris and rust and lead within them, and they become a primary source. So it could be as simple as just replacing an old one with a new one, changing the design. If it’s pipe problem, if the problem is in the solder joints within the plumbing system you may have to do a replacement, conventional replacement. Often we can come in as an alternative to replacement might be much easier and quicker for us to use our ePIPE epoxy coating system. It’s patented for lead abatement. And we would come in, sandblast and clean the inside of the lines, get a good surface for adhesion, and we’d apply the epoxy coating to the interior of that pipe, and we’d replace every single valve and connection after that and retest to verify it being lead-free at that point. That’s extreme. We hope we can do it on a, easier, simple replacement, verifying sources and then repair. And so it’s a big process, and that’s how we would approach it. Charlie: Gary, with such a risk of lead in the water I imagine there’s going to come a time when if I’m buying a house I want to know if it’s been tested for lead. Gary: Absolutely. I think more and more you’re going to start seeing as part of any disclosure, every home sold in Texas you have the seller’s disclosure. Often you see, you know, lead-based paint. Well, you’re typically not eating that paint but the fact that it is present, you have to disclose that in older homes. Charlie: Just like aluminum wiring and asbestos and things like that. Right. Gary: Absolutely. And I think that’s going to happen on water, and it should. 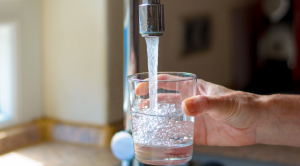 We don’t want to buy a house that you walk into and shortly thereafter have to, you know, go through a process of re-piping or coating in order to drink clean water. Again it’s something you can’t see. Lead is an invisible contaminant. You drink it every day, and you will never know it. But if you knew it, you wouldn’t want to drink it. Charlie: It has no taste or no odor. In a lot of ways, it’s the carbon monoxide of water. Charlie: And whether you’re selling the house or you’re buying a house, the fact is you’re going to be drinking the water in that house, so you want to have it checked and, Gary, your LeadSmart program sounds like the smart way to make sure your water is healthy. Charlie: Gary, thanks so much for your time today. Gary: Appreciate it, Charlie. Thanks a bunch.